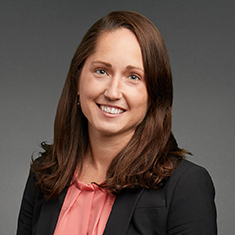 Guylaine Haché is an associate in the firm's Intellectual Property group in the Chicago office, where she focuses primarily on pharmaceutical patent litigation. Guylaine has experience in all stages of litigation, including conducting pre-suit investigation work, handling fact and expert discovery, preparing various pleadings, preparing experts for depositions and participating in trial preparation. Guylaine began her legal career in 2010 as a technical advisor and later patent agent at an international law firm, where she prepared and prosecuted numerous patent applications, in the United States and abroad, for clients and inventors from large corporations, start-up companies and universities. Her technology focus included a wide range of technologies, including modified proteins, fusion proteins, nucleic acid therapeutics, antibody development, methods of treatment, diagnostic methods, drug formulations and dosage regimens. Guylaine's doctoral dissertation related to understanding the molecular mechanism by which a human protein called APOBEC3G inhibits the replication of human immunodeficiency virus. Her doctoral work led to nine publications in peer-reviewed journals, including Current Biology, PLoS Pathogens and Journal of Virology. Shown below is a selection of Guylaine’s engagements.